LifePro has created a simple, repeatable process to ensure your clients will have confidence going into retirement knowing regardless of what happens in the stock market they will have a strong retirement income foundation. 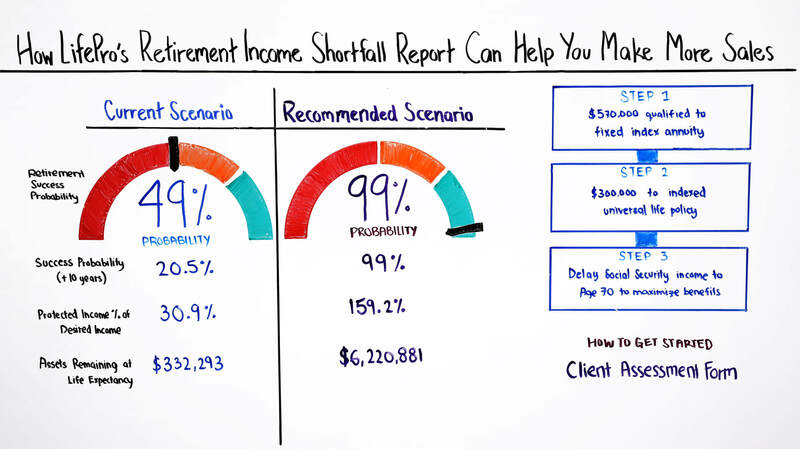 What’s included in the Retirement Income Shortfall Analysis? 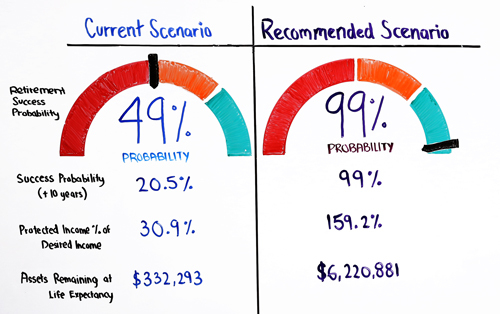 The report compares your client’s current retirement success probability alongside the success probability of a recommended scenario. It also provides a breakdown of the 4 major risks during retirement and highlights the 4 recommended sources of income that can potentially create guaranteed income for life and protection from those risks. Hi. 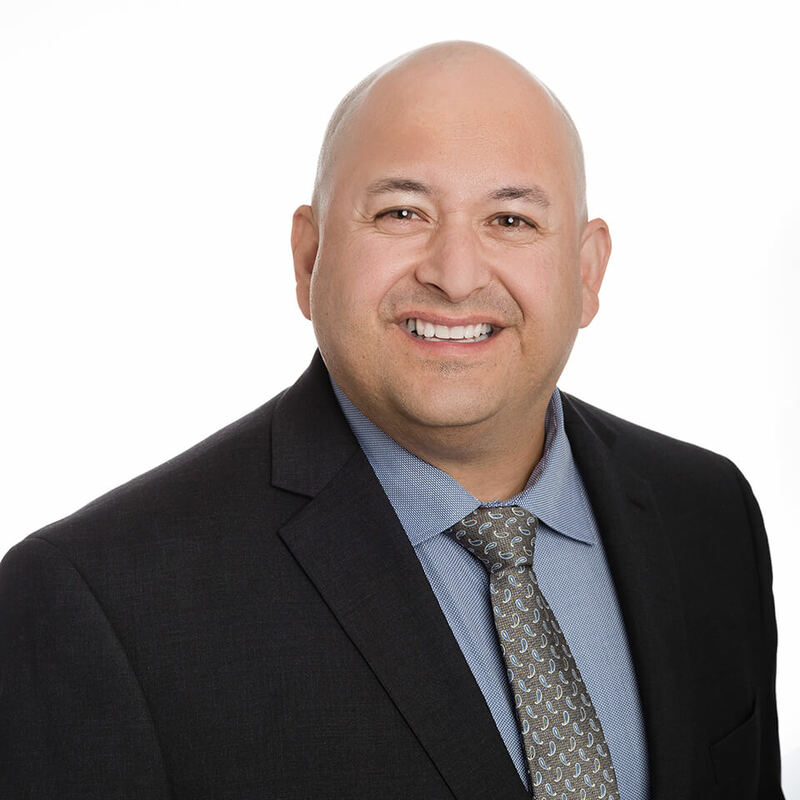 My name is Sal Mendoza and welcome back to Money Script Monday. Today, we're going to be talking about how LifePro's Retirement Income Shortfall can help you make more sales. Before we get started, let's first draw a little picture. This is important because when you're talking to a client, sometimes you want to talk in stories and pictures. You want to draw stuff just to kind of get them in the mood before you start to open up and show them numbers. One of the analogies that we use in retirement is the plane story, and it's really simple. So, let's go ahead and paint it up. Let's say that you have a client that's maybe a couple of years from retirement. And let's say that the promise is that they're on the West Coast and we're going to promise them when they're in retirement that they're going to get to New York City. That's the first thing that they're going to do. When they get to New York City, they're going to go ahead and they're going to have a suite at the Westin. They're going to take a bike ride at Central Park. They're going to have a dinner at the amazing Smith and Lewinsky, which is in downtown Manhattan, which is probably one of the best chop houses in New York. Then finally they're going to go to a play. And of course, what is the number one play in New York right now? It's probably Hamilton. Here's the catch. The catch is that there's 10 planes and they have to pick the plane that's actually going to make it. Because it turns out, just like their retirement, out of the 10 planes only 5 are going to make it. The other 5 are actually going to run out of gas and they're going to explode. All of a sudden, if you were to tell that to someone who's about to retire, that here are the gifts in retirement, but in order to get there, you've got to catch one of these 10 planes, but only 5 of them are going to make it. That means you only have a 50% probability that you're actually going to enjoy your retirement. If you can work together, that I become your thinking partner, and we were to move some stuff around. Maybe go ahead and move some of the fuel into all the planes and now, all of a sudden, it doesn't matter which one of the 10 planes that we take to New York. All of them are going to make it or now we have a least a 99% probability that they're all going to make it and you're going to enjoy yourself a very nice retirement. That's what this report is all about. So, let's get kind of get started. So, over here on my right-hand side, you'll see a current scenario and a recommended scenario. This is where they're at today. And this is what happens once they're working with you, the advisor, the life agent, they're thinking partner. In the current scenario, they have a 49% chance that they're going to have at least one dollar at life expectancy. In this scenario, life expectancy is defined as 85 years old. We've ran about a thousand Monte Carlo simulations in order to get this 49%. However, if they work with you and we were to make some adjustments in their portfolio and move some money around that is increased from 49% to 99%. Let's move on. Success probability plus 10 years, 20%, not a good number. You're always looking for numbers that are up high when you're looking at these shortfall reports. This basically means that both couples 10 years past life expectancy, that they'll have at least one dollar. That dropped from 49%, which wasn't good, all the way to 20% in their current scenario, but you'll notice here, in our recommended scenario, it still stays at 99%. The next part is their protected income as a percentage which is the desired income. Their desired income right now that's protected is 30%, 31% depending on how you look at it. And so that's not good. Protected income as defined by us means anything as the pension, a social security, an annuity, specifically a SPIA or an FIA, and a life insurance, specifically an indexed universal life. If they were to work with us we can increase that to about 159%. The last part of this scenario is that the assets remaining at life expectancy. If they were to do nothing and they never met you and they just did status quo, they would have around a little over $300,000 to transfer to their children, to their beneficiary, their living legacy. But in this scenario over here, once we move some money around it's a little bit over $6 million because we've introduced life insurance into the mix. Now the question is how do we do it? There are three steps that are a part of the 11-page report. We break it down into three steps that you're going to find on page 10 or page 11. In order to get to the recommended scenario, which looks a lot better than the current scenario that they're in today. Step 1: The first thing we want to do is that we're going to recommend that we move $570,000 into a fixed index annuity. That's coming from their qualified accounts. Step 2: The second step is that we're going to move around $300,000 in their non-qualified accounts into into an index universal life. This is why you see this massive death benefit that we're going to be able to transfer between the annuity and the life insurance and life expectancy. 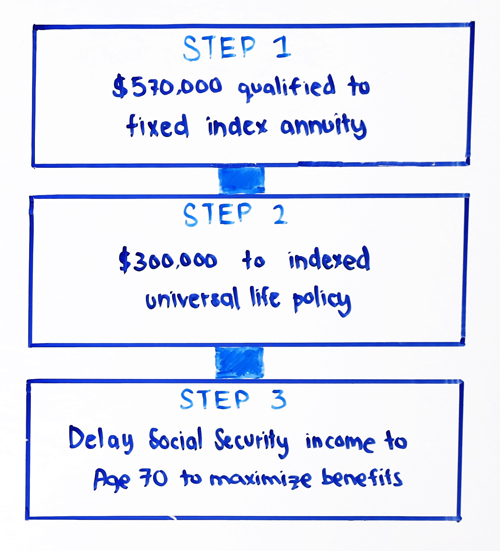 Step 3: The last thing that we're going to do after running scenarios and playing around with the numbers here is that, for people who have a lot of assets we're going to try to recommend that they delay social security in this scenario is a perfect scenario. This is a live case that I actually worked on with one of my advisors that we're actually going to app next week. As you can see here, we're going to delay that social security to age 70. It just makes a lot of sense when they see their current scenario and the recommended scenario. That retirement income shortfall analysis is 11 pages. It's really easy to read and most of the information is on the third page, which is this area right here. There's two ways of approaching that. The first thing that you can do is you can actually open up the third page, get your highlighter and kind of start marking the current scenario and recommended scenario and work your way down. The other, which I really like, is to grab a clean sheet of paper right in front of your clients. Go ahead and open up to page three and then just start to write this down. You don't have to put down the graphs. Just current scenario, recommended scenario, 49%, 99% and just keep on working your way down. They'll understand what the report really means before you started flipping open the pages and the pages will support all the numbers. The question is how can you get started with your clients? How can you make more sales? At the end of the day, our job here is to help you create more sales. The first thing we want to do is to fill out what's called your wealth assessment form. This wealth assessment form can be completed two ways. One, it's unlocked. That means for the people who enjoy doing things electronically, you can type this in, putting your information with your client on the phone or in front, and then go ahead and just email that to your FSR or to me and we can get started. Once I analyze everything, if everything is complete, we can go ahead and start that report for you. Or, if it's not complete, we'll call you. We'll go over a few situations just to make sure that we understand exactly what you're looking for. Then we can start the actual report itself. As you can see, it's only two pages. It's really easy. It takes maybe about 20 to 30 minutes, but it's how we're able to create the retirement income shortfall analysis. We believe when you're able to talk about everything, when you're talking about social security, when you're talking about index universal life. When you're adding a pension, when you're adding an annuity, and you're taking everything. Now you're giving them a really good snapshot of where they're at today, 49%, or where they could potentially be by just shifting some money from investments. Which is typically really volatile for someone who's in retirement, too many ups, too many downs into more protected income. Then they can experience that trip in New York City where they can get to that nice suite, where they can get on that bike ride in Central Park. Where they can have that nice, beautiful, amazing dinner at the famous Smith and Lewinsky, and of course, watch the Hamilton show after. My name's Sal. Thank you for letting me share today.